Supernatural takes some time to really explore the nature of the Winchester’s relationship at this point in the season as Sam goes looking for a book that will help Rowena translate the text he found last week. I have frequently mentioned in my other reviews that Sam has taken something of a back seat this season and only tends to appear in episodes to supplement Dean’s story rather than have any development of his own. It’s refreshing to have an episode where he is the central figure and have Dean play the supporting role. Sam’s role in this episode is still keeping the focus on helping Dean cure the Mark of Cain but it’s interesting to explore how the proximity to it has affected him. He has become obsessed with saving his brother and finding a cure so has focused all of his energies on doing just that. We’re still at the point where he feels he has to lie to Dean for reasons I still can’t quite figure out but that’ll come crashing down soon enough. I’m still baffled by the notion that he would go to Rowena for help but at least he’s not being stupid about it. She’s charismatic and charming -or at least appears to be based on how she interacts with others, I don’t personally see it- but Sam sees through that and always keeps her at arms length just in case he falls for any of her nonsense. His acceptance of her part of the bargain involving killing Crowley will surely make for some interesting conflict when he tries that and Dean ultimately disapproves. The premise this week involves a box that houses a great evil but also holds a book that will help Rowena find a cure for Dean. It’s not as simple as opening the box and taking it because whatever is inside infects people and forces them to relive painful memories until they are driven to kill themselves. It’s a pretty simple horror concept but it works incredibly well at showing the Winchester’s some home truths for better and for worse. The character of Susie is impressively tragic as a person who has lived in that house for most of her life knowing that the box is in her basement and caused her family to commit suicide. She knows how dangerous it is and clearly doesn’t want anyone else to come to harm because of it. Brenda Bakke does a fantastic job playing Susie as a woman who has lived her whole life in terror and doesn’t want any human contact. When the box is opened and she sees her family again she is driven to suicide and them Sam’s mind uses her as the manifestation of his regrets. She represents every person the Winchesters have failed to save over the past decade and how much that affects them. They don’t talk about it very much because if they did then they’d go insane but it’s there beneath the surface and it was interesting to see Sam forced to deal with that. Rowena lifts him out of it but before that point Jared Padalecki played the distress perfectly. 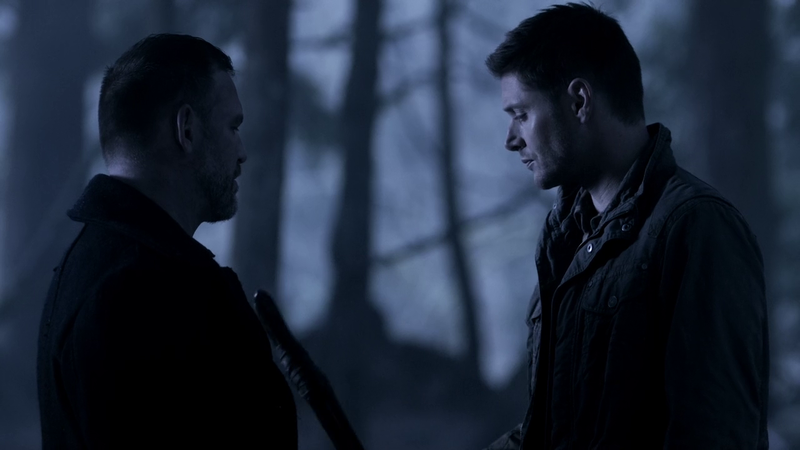 Dean being shown the illusion of purgatory with Benny (Ty Olsson) filling his head with the necessary doubts was really interesting to see. Benny is definitely one of the characters who gets Dean in ways that others don’t so using him as a catalyst to get him to end his life makes a lot of sense. The dialogue between the two of them is really illuminating as it shows where Dean is in terms of his devotion to hunting. It’s something he can’t live without and he likes that he is able to help people by doing it. Having the Mark of Cain be the thing that allows him to see through the illusion is pretty much as expected. Whenever we see something that affects “normal” people on the show Dean will be affected differently because of the mark. It’s becoming a trope now but in this instance it makes a lot of sense. Being a curse the Mark of Cain exerts some influence on Dean and it seems to enhance his self preservation instinct so having some ghostly presence whispering in his ear about killing himself won’t quite be enough to break through the powerful magic encouraging him to do otherwise. I also found his admission that he loved being in purgatory really fascinating. It’s something that feels appropriate to his character given how hunting is his life. It’s a place where he can do that all the time and for Dean I can understand how that would give him some kind of inner peace. It’s also makes sense that Dean would be willing to end his life if he really had to but won’t do so otherwise. A really strong episode that lets Sam take the center stage for a refreshing change of pace in this season. The interesting thing about Sam’s development in this episode is that he has definitely become obsessed with curing Dean of the Mark of Cain. he has been just as affected by it as Dean but in a very different way. He is willing to do anything to make sure Dean gets rid of it. Unfortunately this causes Sam to do some really stupid things like working with Rowena. I still don’t understand why he’s doing it but I’m glad that he’s not being stupid about it. He’s keeping her at arms length so that he doesn’t fall for her charisma and charm like so many others seem to. He’s using her as a means to an end and happily accepts her part of the bargain to kill Crowley for her. What that will result in it’s hard to say. Sam has also gotten very used to lying to Dean which just won’t end well for him as usual. It’s a really boring cycle of lies, truth and then more lies that these two characters are stuck in and it really needs to stop. Compelling drama can be created by them being truthful and disagreeing. I really liked the plot line of the box that makes people revisit uncomfortable memories until they are driven to suicide rather than have to face them. The character of Susie was well used as someone who has had the box sitting in her basement pretty much her entire life and is determined to ensure that nobody else is hurt by it even if it means shutting herself off from the world. Susie was a very tragic character and it felt unfortunate when she shot herself because she couldn’t take the torment of the visions of her family. Having her appear to Sam and represent his guilt over the loss of all the people they couldn’t save over the years was a clever touch and really forced Sam to revisit some things he likes to keep buried. 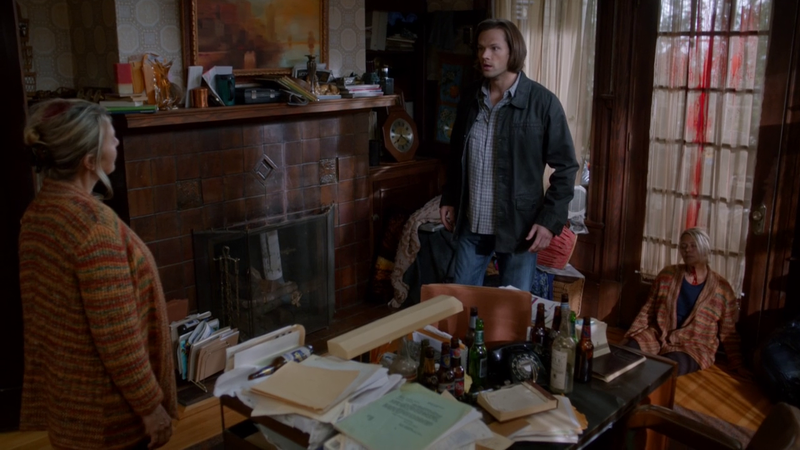 Dean having the vision of purgatory and Benny was a nice touch as well. If Dean is going to listen to anyone it would probably be Benny and it was interesting to see Dean be introspective about what’s important to him in life. It’s clear that he can’t live without hunting but it was interesting to find out that Purgatory was a place that he loved because it meant he could do that all of the time. It’s also good to see that he has no desire to kill himself as long as he doesn’t need to as well as the Mark of Cain allowing him not to be drawn in by this false vision.